Do you ever refuse to go out to dinner because you aren’t sure what you can order that is TMD friendly? Eating out is such a big part of our social lives, here is a list of TMD friendly menu items from our favorite restaurants. Cheesecake, Cheesecake, and more Cheesecake!!!!! Some of the above menu selections are regional and not available at all locations. All menu choices were selected for a soft chew diet. 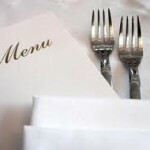 Other items on the above restaurant menus can be adapted for your dietary needs. These items are just suggestions, always follow the advice of your physician.